...some Bowser, and much more. Well, just play it ! Party, party ! 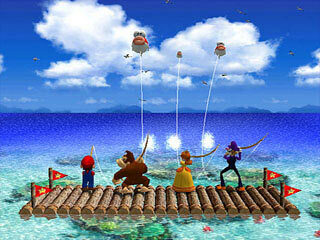 Mario and his friends organize a big party to celebrate their birthday, and you know what ? You're not invited ! Well, no, if you want to join them, you have to buy the game. Ah, greedy Mario... I never had to pay to attend a birthday party, grumble, grumble, here's your money. But, hey, it'd better be worth its price. 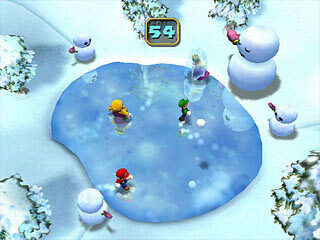 According to Japanese players, it is: Mario Party sold better than Zelda, so far. But let's not forget that Japanese love rubbish (the crazy about Final Fantasy, Gundam and other silly stuff... - yes, I like to make myself new enemis ^0^), and, somehow, it is a bit the case here with Mario Party 4. Mario Party, that's fine, kind of entertaining with friends, but when it sells better than Zelda, it's like lead was more valuable than gold. Number 4 or not, Mario Party GameCube plays like the three past Nintendo 64 games, with some better graphics: a few different theme boards, plenty of mini-games around, most are nice, others are annoying or stupid, and an overall slowness which makes it unbearable if you're in hurry or if you really want to play, but makes it the perfect companion if you're doing something else (cooking, eating, talking...) or if you are playing with yoru family or your buddies. Alone, obviously, it's more difficult to enjoy Mario Party 4, especially when you have to wait for the end of the three computer players' turns. 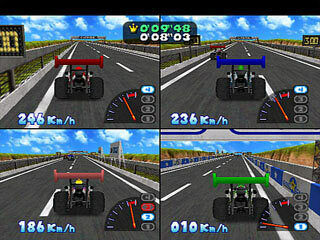 There are many ways to enjoy yourself though, including some special mini-games you can't play in normal modes. You can also try to set some records or finish the game with different characters in different difficulty levels (the present room is really bad compared to Magical Mirror). The problem is that if the slowness gets on your nerves of if you dislike the main idea of the game, it won't help much. 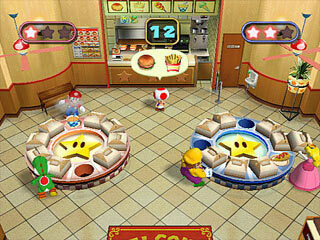 However, are there anybody else but Mario party fans who buy Mario Party games ? Yet, even fans could complain about a few things like the lack of improvements over the past games or, eventually, how important luck is. Some more characters or a greater diversity among them would have been welcomed too, and one item is too effective: the magic lamp, it's easy to get, cheap and bring you straight to the star. 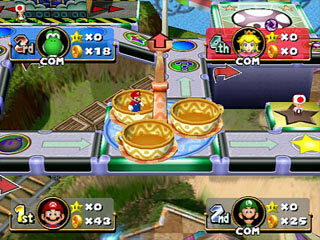 But Mario Party does some things well too, like making the board interesting to play several times, because some games are harder to get (the mini-attractions, the lottery...). The final confrontation with Bowser on a magma cube is original and well done too, a nice mix of Mario's action in Hudson's style (it reminded me Bomberman Hero). And, if luck has the big part, a touch of strategy from human players can often change the game's issue, for instance by using an item at the appropriate time. 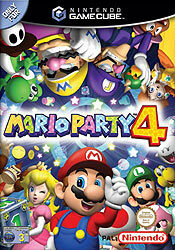 Mario Party 4 is not a revolution, it's just one more party. It's not even a great concept or something special, it's a kind of lucky mini-game ! "lucky", because despite all its numerous drawbacks it keeps selling amazingly well. Seemingly lots of people like the main idea even if they don't get anything really new... ah well, never mind, just forget it and let's have a party ! "Toad, Koopa and other party-planning pranksters have hidden birthday presents for their closest friends inside the Party Cube. 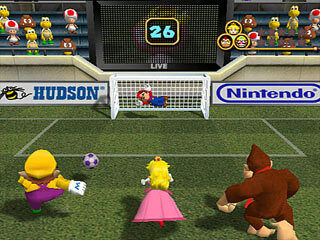 To win the presents, Mario, Yoshi, Peach and other Mushroom Kingdom favorites will have to plunge into a circus of minigame trickery. As always, keep an eye out for Bowser and his trouble-making goons. Whatever it is they're up to, it can't be good. Even Whomp and Thwomp have rockin' surprises for you in their Extra Room! 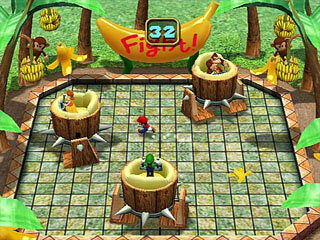 Packed with great surprises, wild multiplayer action and zany challenges, Mario Party 4 is your ticket to a sure-fire good time." 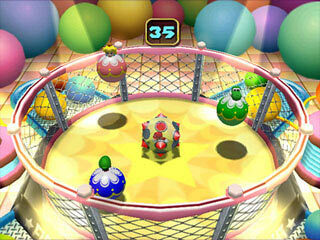 "- Challenge your friends to see who's best in 50 amazingly clever all-new minigames! 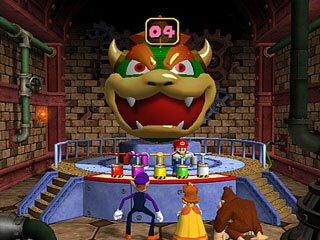 - Interactive game boards are stocked with item shops, mystery spaces and shortcuts like roller-coaster rides. - A cool Mini-Mega system allows you to grow larger or smaller. Depending on your size, you'll be able to access exclusive areas or trigger special events. 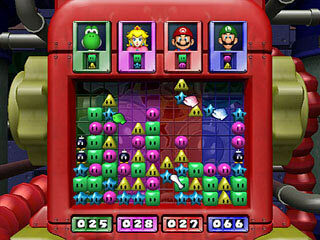 - Team up with another player in Tag Battle Mode and compete in a team-versus-team struggle for the most stars." 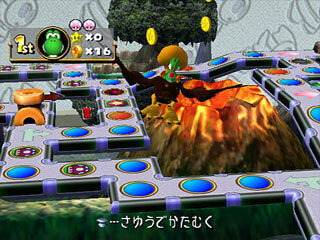 Just like all the other Mario Party predecessors, this game keeps me entertained for hours. 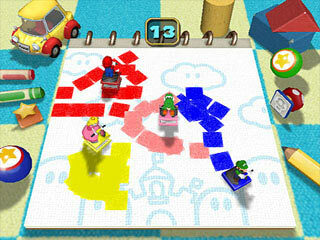 Challenging new mini-games, exciting boards and events, a slew of interesting characters...what's not to love? I will say though, that the one-player storyline setup leave something to be desired. All in all, one of my faves!